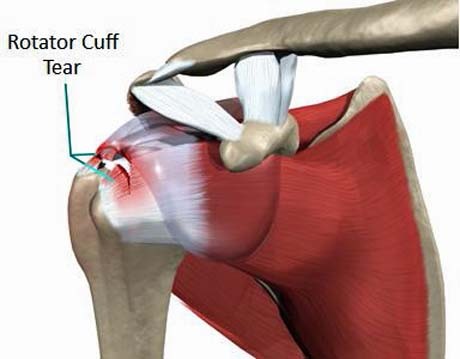 ROTATOR CUFF TEAR | GEORGE D. GOUDELIS MD. Ph.D. The rotator cuff of the shoulder formed by four muscles and so named because of the formation of the tendon. The muscles that form the horseshoe is supraspinatus, infraspinatus the the teres minor and subscapularis muscles. The rupture of the rotator cuff commonly found in people over the age of 40 who make handwork for many years and often raise their hands above shoulder level. Also athletes (javelin, ball or mallet) and voleyball players, swimmers or weightlifters are groups of people with common problems on their shoulders. As time passes, the charge brings progressive deterioration of the rotator muscle groups, thinning and finally break them. a sense of noise into the joint during movements. The diagnosis of injury based on symptoms of the patient, the clinical examination by the Orthopaedic and the imaging evaluation of the joint, which consists of plain radiographs and magnetic resonance imaging with or without injection of contrast agent (gadolinium). Sometimes the performance of diagnostic ultrasound can help. 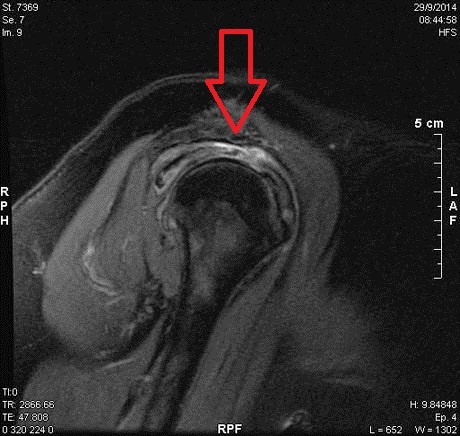 The rupture of the rotator cuff of the shoulder (supraspinatus, infraspinatus, teres minor and subscapularis muscles) might relate to a tendon or the four as well be partial or total. The type of surgery depends on the size, type and location of ruptured tendons. 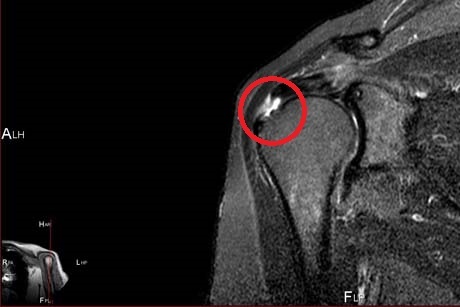 The small tears treated arthroscopically by cleaning the muscles and perhaps opening the space between the acromion and the humeral head (akromioplastiki). If the tear is large or full time performed arthroscopic suture of the tendons. The arthroscopy is the most advanced orthopedic surgical method in the world, which allows qualified Orthopaedic surgeon to diagnose and intervene therapeutically by using surgical instruments in size of a pen and imported into the joint by three main holes in the front, sides and back of shoulder . The arthroscope contains optical fibers that transmit the image taken from inside the shoulder with external editor to view a monitor (TV). From the image displayed on the monitor, the Orthopaedic Surgeon examine carefully and in great detail the inside of the knee and decide on the nature of the problem and treat it. During arthroscopy, the doctor can insert special surgical tools from the second hole or the third hole by acting thus diagnostic and therapeutic. The small incisions in the sides and back of the shoulder for the introduction of specific tools and camera. If you have decided on the surgery should tell you the Orthopaedic Surgeon on the current state of your health, your medical history as well as drugs you take. Admission to the clinic the same day of surgery. The previous evening must come to the clinic to make the required preoperative control which consists of blood tests, chest radiograph and electrocardiogram monitoring. Just finished this stage you are leaving the clinic. The evening before surgery you can eat normally. The morning before surgery did not eat and not drink anything until the surgery. In case you need to take medications for other reasons you can drink a little water normally. In the morning you import into the clinic (Patient Transport Office) and go to the room where you will visit the Anesthesiologist to examine you and discuss with him the method of anesthesia. In arthroscopic surgery of the shoulder joint of the world, two methods of anesthesia, general anesthesia and the anesthesia of whole upper limb. The patient receives general anesthesia and also usually anesthesia of the upper limb which would protect the patient from postoperative pain of the first hours after surgery. 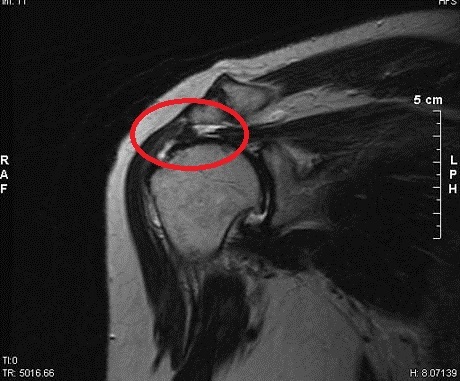 The duration of arthroscopy depends on the therapeutic intervention that will make the Orthopaedic Surgeon and ranges from 60 minutes (single acromioplasty) up to 3 hours (compilation of rotator cuff rotator or stapling of the labrum -Bankart lesions- in a repeated dislocation of joints). At the end of the Orthopaedic surgery stitches the suture holes or special tapes and wraps the shoulder with Velcro. The patient is transferred to the resuscitation room where the surgery will remain for some time to properly reset. The patient leaves the clinic the next day. Mini Open technique is a modern procedure after surgery includes two parts. Originally performed arthroscopy to review and cleansing the joint. Then Orthopaedic Surgeon perform skin incision, approximately 5 cm and faces - stitches - the rupture of the rotator cuff open. Surgical incision of Mini Open technique in which the suture of tendon conducted openly. The postoperative physical therapy is one important part of recovery and full functional rehabilitation in everyday professional and sports activities of patients undergoing surgical treatment. The shoulder joint is needed prolonged postoperative physical-therapy (2-3 months) by an experienced physiotherapist to regain normal mobility of the full extent thereof, and the gradual strengthening of the muscle groups surrounding the joint. Collaboration of Orthopaedic Surgeons with a physiotherapist to design the plan of rehabilitation of the patient and the continuous monitoring of therapeutic development is the golden rule of good therapeutic approach to the patient.